Ek Tha Tiger, a Hindi movie, is not currently screening in Hyderabad. No doubt, the reviewer was paid good to write all the nonsense. I could sit there for the whole time, the movie lacked plot, acting (not if you like salman) and sense. If people like salman so much, why don't they watch his old movies again and again. He does the same thing in every movie: stupid acting, chinese action scenes and cracking silly jokes. Of course, those who thought Wanted, Ready, Bodyguard were good movies, would like it too, as it is yet another rubbish. Not far are the days when Salman would film himself shitting in toilet and people would go to theatres to watch it. Need a reason to believe in God? Learn from Salman. 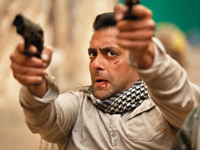 For the past three years, every one of his Ramzan releases - including Wanted and Dabangg - has pretty much ruled the BO. And we have good reason to believe that Ek Tha Tiger will surely make the cut. And the reason would be... well, it's a long story. fullhyd.com has 700,000+ monthly visits. Tell Hyderabad what you feel about Ek Tha Tiger, and then also see all user reviews for Ek Tha Tiger!